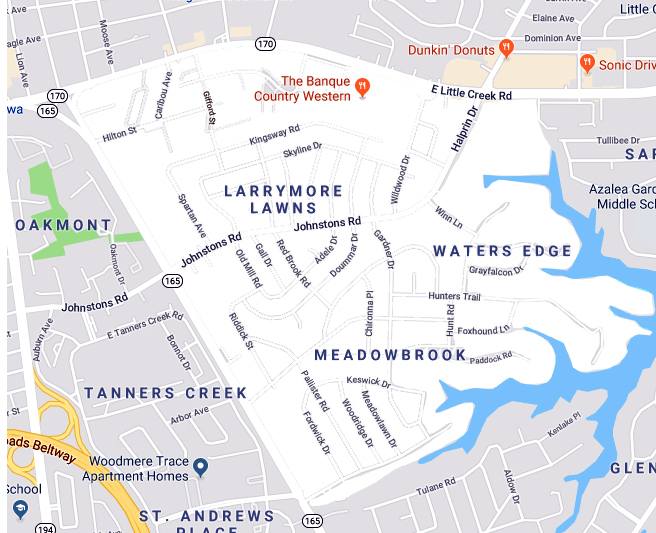 The Lake Whitehurst West Civic League, Inc is the second largest civic league in the City of Norfolk, with over 1,100 households in five neighborhoods: Larrymore Lawns, Meadowbrook Forest, Meadowbrook Terrace, Hunt Club Point, and Water’s Edge. We are a registered 501(c)(4) non-profit organization. The mission of the League is to encourage and empower residents of diverse backgrounds and interests to work together in the development of a safe and healthy neighborhood that may involve neighborhood plans and proposals with respect to land use, zoning, parks, open space, recreation, schools, community facilities, traffic and other factors affecting the quality of life, and social and economic well-being of all residents in our service area. Our monthly meetings are great opportunities to meet your neighbors, learn what’s going in in your City, and hear from interesting speakers on a variety of relevant topics. We also produce a number of social events and activities each year, including our annual community yard sale (May), our summer picnic (July), and our holiday social (December). If you are a resident in our service are, or live outside that are but would like to support us, join us for $15 per year.